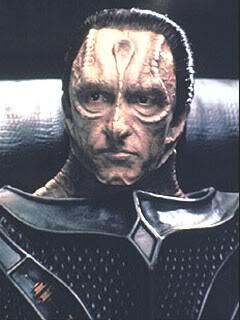 Gul Levat is a Cardassian military officer turned ruler of the Cardassian Union. Levat is known for his superior intellect and brutal tactics in both the military and political arenas. He is cerebral in all that he does, making him a formidable foe with almost everyone. Levat feels the territory dispute in the Gateway Sector is his first true test as leader of the Cardassia Union, and is relentless in his attempt to see Cardassia victorious in the conflict, even if it means waging war with the Sindareen, and possibly the Federation. Levat was an up-in-coming military officer during the Dominion War, however; the war’s end saw Cardassia Prime fall and left in shambles. Levat was not immune to the defeat. His struggle to survive saw him flee the Cardassian Union and go into hiding for a couple of years. However, he later returned and assisted Cardassia during its rebuilding period. This gained him recognition from the Cardassian military, which he was later re-enlisted. Levat was well-liked by his superiors, and he saw his military stock steadily rise once again. The Cardassian Union closed off its borders for several years, as it continued to rebuild and flourish. However, during this time, the Cardassian Union became very introverted and continuously felt its safety was in jeopardy, by both internal and external enemies. Levat was at the center of the Cardassia recovery, and began to gain respect and support from the Cardassian Union, military and civilian alike. He was later promoted to Gul and given command of the Cardassian Warship Ravage, the flag ship of the Cardassian Union. Although well respected, Levat’s support was garnered mostly through fear, as he had a reputation for executing merciless and calculating strikes against any he thought opposed the Cardassian Government. The Cardassian Union saw itself leaning heavily on its military for survival and support once again, with Gul Levat later becoming the commander of Cardassian Central Command. Levat’s first act as now one of the heads of the Cardassian military was to reinstitute the Obsidian Order, Cardassian Intelligence known for its corrupt and brutal operations. Levat felt that for Cardassia to truly survive and flourish, it must gain as much information as possible, whether it be from the Cardassian Union itself or possible threats in the galaxy. Having recovered from their losses in the Dominion War and later the Rukakon War, the Cardassians began to expand their territories in space (the Gateway Sector included), and eventually re-established themselves as a super-power in the galaxy. Most of the credit was given to Gul Levat, as his plans and execution saw Cardassia flourish. And at the beginning of 2384, Gul Levat was declared ruler of the Cardassian Union. Levat is an extremely intelligent and cerebral man. He is also treacherous, manipulative, and extremely powerful. Levat is a feared and respected leader in the galaxy. Levat enjoys combat, marksmanship and Cardassian martial arts. He is also very fond of fishing and has shown an interest in the Terran game, Baseball. He has a strange fetish for Bajoran women. He once had a physical relationship with Sito Jaxa , current waitress and bartender at Heaven Nightclub.